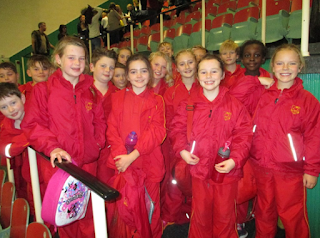 This week our Junior swimming team took part in their first Swimming gala of the season. This is traditionally the furthest away, longest to conclude and biggest event we take part in with over 30 schools attending. Our team performed their individual races over 33m which is 8m further than any other competition - now they know why they have been training hard over the last few weeks! Each event is run over 4 or sometimes 5 heats and it is always difficult to work out official scores. The PA system does not help in any way and so we must wait patiently for the official results to come through before we know if anyone has qualified to swim in the Olympic Pool in London at the National ISA Championships. What we did witness were some fantastic performances from Captain Lottie - 1st in Breaststroke, 2nd in Backstroke and "probably" the fastest time in the Freestyle. This set of results has guaranteed Lottie a place in the team for January, where she will attempt to right the wrongs from last year! Olivia won her Breaststroke heat, Phoebe was 2nd in her Butterfly and Freestyle heat and coupled with some fantastic, competitive swims from everyone else, the season is looking promising from the water babies. Sometimes events like this brings out the true character of our children and none more so than Phoebe (Class 5) who ,when asked to swim in the Butterfly event for the Year 6 race, was heard to state "Yes, I will swim the Butterfly Mr Park, I'll take one for the team" - priceless. Well done everyone who swam, some their first ever experience of competitive swimming. 0 Response to " Grantham Preparatory School – United Kingdom"